The United States finds extensive use for advanced ceramics, and the total market for advanced ceramics in the country is set to grow, due to properties, like high corrosion resistance, ability to withstand fluctuations in temperature, and being lightweight. Other desired qualities are substantial energy-efficiency, environmental protection capabilities, higher lifetime operation costs, and the best-desired performance. 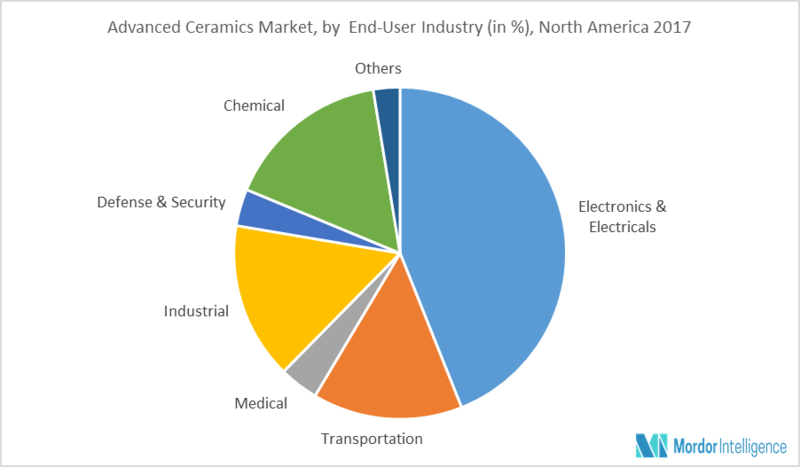 With the growing demand from various end-user industries, such as electrical & electronics, automotive, medical, and chemical, among others, the market for advanced ceramics is projected to register at a high growth rate during the forecast period. Major Players: CeramTec AG, Corning Inc., CoorsTek, Inc., Saint–Gobain Ceramic Materials, and Momentive Performance Materials, among others. January 2017: Morgan Advanced Materials developed new materials for use in aerospace components. January 2017: Momentive Performance Materials Inc. announced that it acquired the operating assets of Sea Lion Technology Inc.
December 2016: Morgan Advanced Materials announced prototype capability for custom piezoceramic microtubes. December 2016: Materion Corporation entered an agreement to acquire Heraeus Target Materials. Along with the customization, we also have an individual report on Nano Ceramic Powders market, which is a part of the Advanced Ceramics market.